Will Robots Take Over Our Jobs? There’s been much speculation in the press, from central banks and global forecasters, CEOs of tech giants, and social commentators, that artificial intelligence (AKA robots) will lead to automation and a mass reduction in workforce. Others believe that AI will drive growth and huge productivity gains, and benefit mankind in untold ways. So will robots take over our jobs? Will mass unemployment and a shift in skills be the mark of innovation driven by AI? Or are we on the cusp of the 5th Industrial Revolution that will enrich our lives? If yours is like most organizations, you are keenly aware that analytics is the fuel for a successful digital transformation. So, given that you have access to voluminous amounts of data and a plethora of algorithms, is there a secret ingredient that you (and most other organizations) are missing? To deliver predictive insights, you need to increase focus on deployment, management, and monitoring of analytic models. To monetize and realize the value of data science, you need to focus on production refinement. This is the secret ingredient leading to competitive advantage. Watch this webinar to learn more. AI is right here, right now—and changing our lives. The ever-present need for business optimization, combined with a long history of applied statistics, explosive growth in data, and recent advances in cloud computing, has created a perfect storm of innovation. A growing number of organizations now have multiple data lakes that use different technologies. These data sources must be integrated into a fused data lake to allow data scientists and other users to access data crucial for analytics. Generally, there are three solutions: Integration by data science tool, by data replication, or by data virtualization. In this webinar Rick van der Lans will set out the pros and cons of each these. The focus will be on how data virtualization technology simplifies access to new data lake architecture. Ten times faster, TIBCO® Data Virtualization 8 sets the standard for big data scale data virtualization with unique and significant advancements in scalability, performance, and workload management. Watch this webinar to hear about the exciting new features in the upcoming release of TIBCO Data Virtualization. Learn about the new massively parallel processing engine (MPP) that enables big data scale workloads, federating queries across data lakes, data marts, and your enterprise data warehouse. Other exciting new features include granular workload management, new data adapters, and developer productivity enhancements for ease of use. TIBCO® Connected Intelligence solutions connect data, systems, processes, and people—and incorporate predictive analytics, data visualization and analytic actions for applications such as asset management, customer engagement, risk investigation, and supply chain management. The TIBCO Connected Intelligence portfolio helps you reduce costs and downtime, increase output, and improve customer retention. It lets you easily construct and embed visual analysis and machine learning models in business processes—and even in field equipment—for responsive batch and on-demand software action. This webinar was hosted by Data Science Central in December 2018.
Business applications are evolving from static operational data providers into interactive analytic applications that can enable better decision-making. Embedded BI is enabling product builders to introduce new sources of value to their applications. Choosing the right level for your application is a critical factor to your customers’ success and happiness. This webinar will describe and demo the five levels of embedded BI helping you determine which level or levels are most appropriate for you. It is designed to provide a framework for approaching and designing an engaging, competitive, and innovative analytic application. Analytics is pervasive and foundational for a modern digital business. And because the pace of innovation is accelerating, analytics becomes even more critical for even more use cases. What are the upcoming analytics innovation trends that will have biggest impact? Attend this webinar to learn more. Join our team of data scientists and data science industry experts for an Ask Me Anything session exploring Data Science and Machine Learning. This is an hour-long session during which you can ask as many questions as possible. You also have the opportunity to ask questions ahead of time by tweeting @TIBCO using the hashtag #TIBCOAMA or posting on the TIBCO data science community. Register Now for this informative session! Artificial Intelligence (AI) and Machine Learning (ML) have the power to disrupt and transform organizations. For some, these are just overused buzzwords—and for others, they are central components of a powerful innovation strategy. Register for this live webinar to prepare for #digitaltransformation, remove barriers, and truly innovate. -What are the key drivers for blockchain, BI & analytics, and app & data integration? -How are companies innovating from a business perspective vs. a technology perspective? -What is the impact on people, process, and technology? -How are companies scaling these technologies through 2020? You’ll get to hear from business intelligence expert Wayne Eckerson from the Eckerson Group. Wayne will discuss key insights from his popular report, “Ultimate Guide to Embedded Analytics.” He’ll cover criteria such as embedding, customization, extensibility, multi-tenancy, and vendors. Create a beautiful report-building oasis for your users. Providing your users and customers with helpful reports and dashboards is one thing. But you can’t expect to predict every question they will have. Ad hoc or self-service reporting puts the power of report-making into your users’ hands. Provided a drag-and-drop interface, users of any skill level can build reports and get answers to custom questions—all on their own. With a few simple steps, you can turn your complex source data into easy-to-understand fields & measures and create a beautiful report-building oasis for your users. Humans are visual learners—well, at least the majority of us are―65% according to the Social Science Research Center. -Combining the power and extensibility of a BI & analytics server with the impressive visualizations of a charting library to deliver seamless end-user experiences inside web applications. Intuitive data visualizations and predictive analytics, reporting and dashboards embedded within key applications, and streaming analytics combining real-time connectivity with analytical insights. 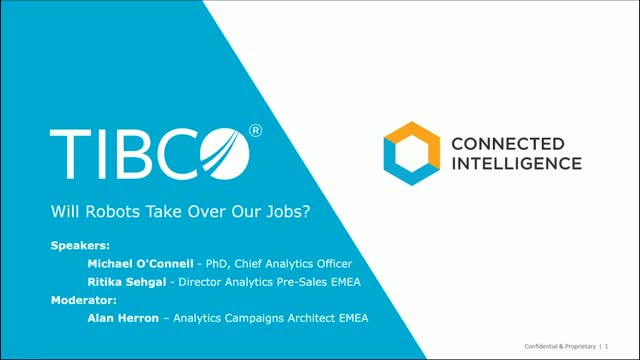 TIBCO supplies all the analytics technologies needed for all digital business initiatives. Title: Will Robots Take Over Our Jobs?